Our courageous approach to educational revitalization leads us to focus on the schools in the direst of situations. Traditional charter school management organizations typically form and operate new schools from scratch for which they recruit and compete for students from nearby public schools. Matchbook Learning, however, partners with currently failing schools and their communities to successfully turn these schools around rather than build competing schools. We work with the existing students and committed staff who join us to envision and to develop a highly successful educational environment at their school. We’ve developed a competency-based personalized model that we believe allows us to keep this commitment while helping all students progress to grade level and beyond. In order to do this, we begin with a foundational belief: effective teaching is the key to effective learning. Research shows that when a student receives a highly effective teacher four years in a row, the achievement gap is eliminated. So our unique value proposition lies in personalizing the teaching experience. 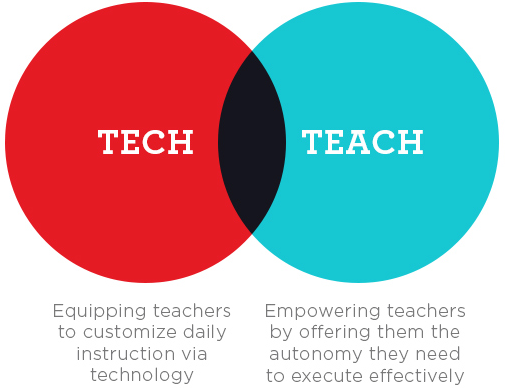 We call it a “blended” approach because it joins together two critical components: technology and teaching. We’ve found that this blended approach gives teachers a sense of purpose in their work, and in turn, bestows on students the same attribute. And when schools can infuse their students’ learning experience with purpose and meaning, student motivation and performance increases. Of course, this may sound good, but how does it work exactly? The answer is twofold. First, Matchbook implements a blended design that assesses the strengths and weaknesses of the existing staff, recruits and retains new staff, cultivates the unique ability and goals of each faculty member, evaluates the current learning capacity of each student and develops trajectories to monitor and manage within cohorts. In addition, our blended design includes calibrating school policies, school calendars, and school budget allocations to align to Matchbook’s blended themes of personalized instruction. Learn about our Spark technology. Second, Matchbook facilitates blended coaching to empower teachers to excel. We create daily, weekly and monthly data reports upon which coaching can be provided for customizing lesson plans and real time intervention. Our full-time onsite Directors of Personalized Learning help to create space and time for teachers to collaborate, learn, and grow. Teachers are assessed based on their ability to personalize instruction for the students they are responsible for and focuses on helping them improve their overall performance. Learn about our teacher experience. By combining blended design and blended coaching into a singular, streamlined approach, Matchbook is able to offer an unparalleled educational product. Other models ignore these aspects, focusing largely on the student in an effort to indirectly improve the performance of teachers. Rather than bypass teachers, we engage them in the process of personalized instruction for the benefit of each and every student. Matchbook Learning’s comprehensive school design focuses both on the final product and also the process itself. Our proprietary “blended conversion” process transforms an existing “turnaround” school into a blended school that blends both face-to-face and online instruction. It leverages online curriculums but also delivers them to students in a 1:1 computing environment inside a brick-and-mortar K-12 public school. This process involves 206 unique steps covering four distinct stages. This 206-step process creates a blended school design product that has certain critical elements that are consistent across all Matchbook Learning schools. Learn more about our methodology.